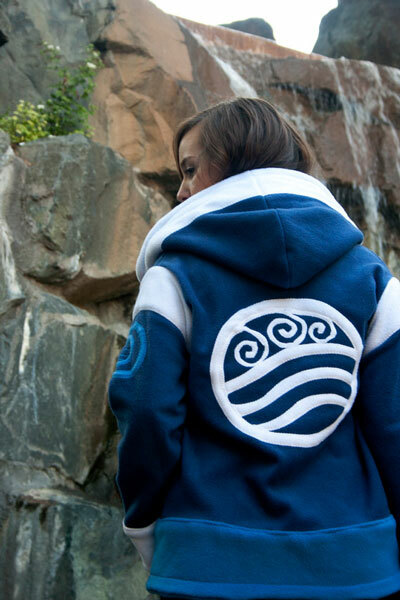 This Water Tribe Hoodie from The Last Airbender/The Legend of Korra looks so warm and comfy! 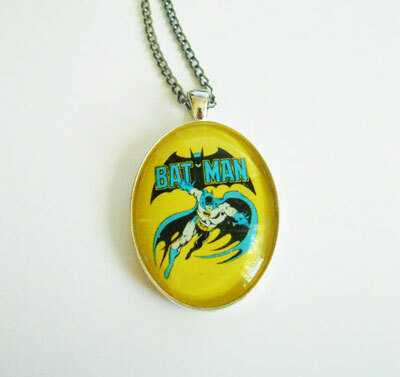 I love this design from etsy store RaritysBoutique; it looks awesome. Sadly though Viacom (which owns Nickelodeon) made them take down the Avatar hoodies, so you can’t order one anymore. On the back is the water element symbol, while on the shoulder you can find the water nation symbol. The shop also did hoodies for the other elements (Earth Kingdom, Fire Nation and Air Nomad), but those have also been pulled. They still sell a very large range of My Little Pony ones though which also look great (if you My Little Pony). 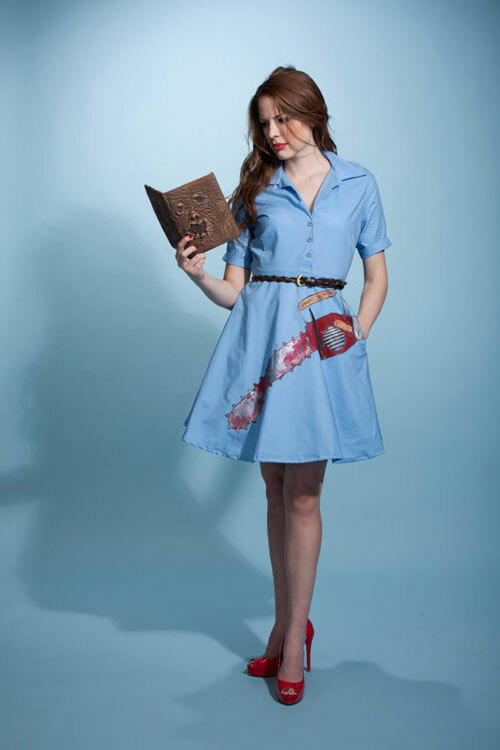 I’m really liking these dress designs from etsy store Nerd Alert Designs. Some of them I can imagine just wearing any day, but a couple are definitely more costumey and aimed at the cosplayer crowd. They’re still awesome designs though! 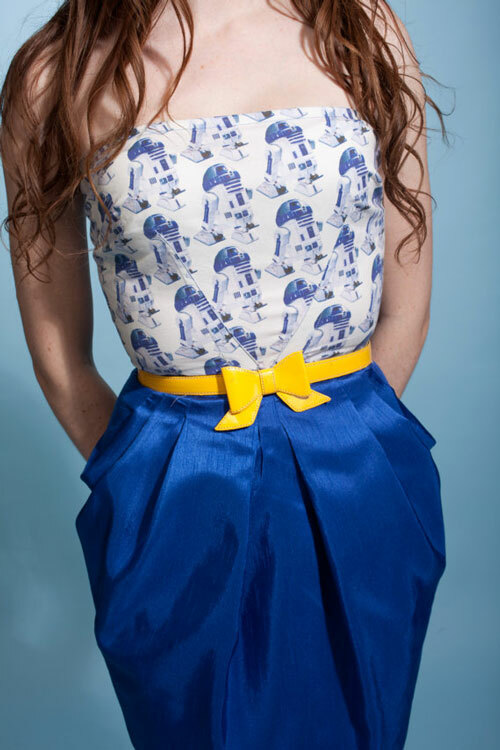 This is my favourite design; the cut of the dress looks great plus the little Darth Vader helmets look so cute! Another adorable dress! The belt isn’t included, but it fits perfectly. I only wish the colours of this dress were a bit more vibrant. 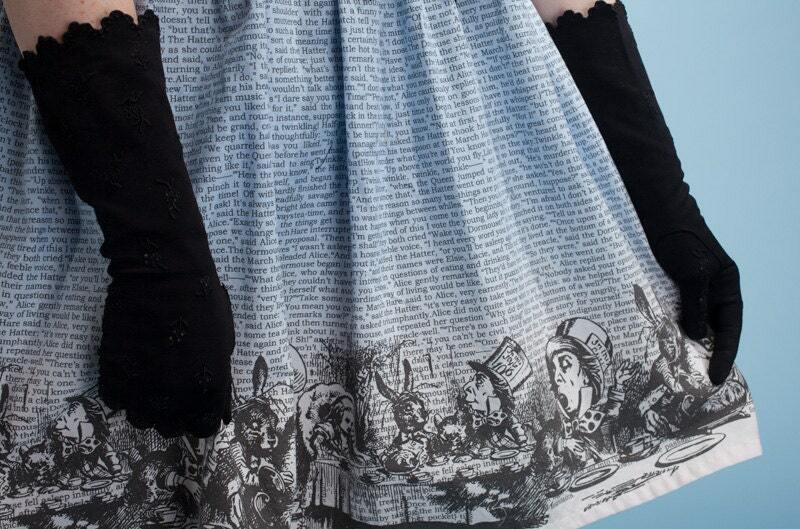 You can’t really see the details in this photo, but the skirt consist of text from Alice in Wonderland with illustrations from it lining the bottom (see this photo for a closeup). I love this dress! There’s a pocket on the left side dress turning your hand instantly into a CHAINSAW hand! 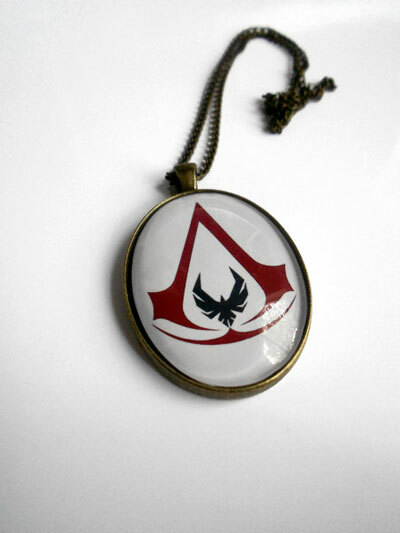 Not something I’d consider wearing, but it does look great. 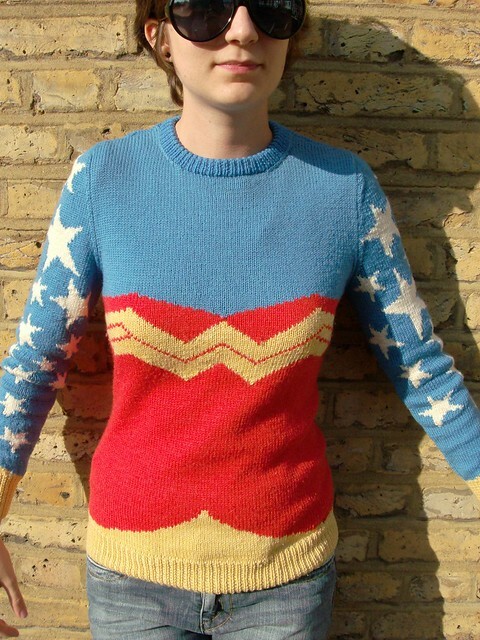 If you know how to knit, the guide on how to make it is up on Ravelry. 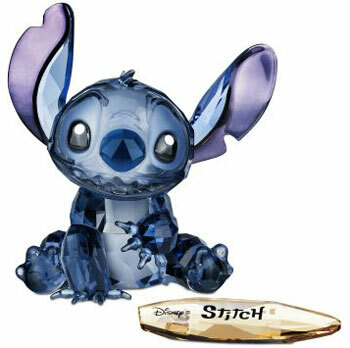 Anyone want to make this for me? 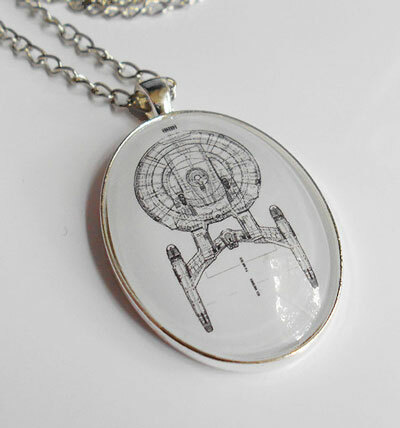 Back in February I blogged about 5 Geeky Necklaces and ended up getting 2 of them for my birthday. 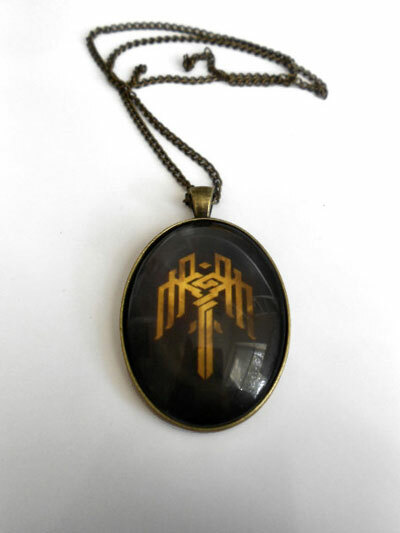 My favourite one which I wear a lot is the Portal necklace from etsy store Land of Rapture. 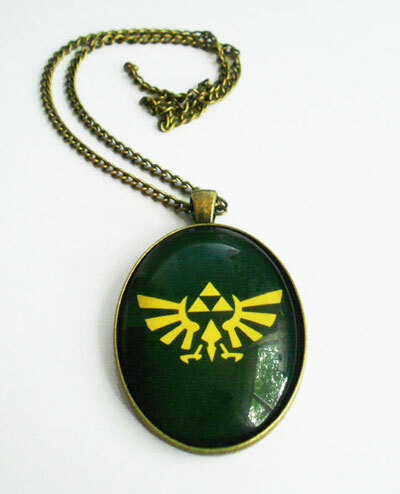 I can’t wait until it gets delivered and I can wear it. It’s so pretty! 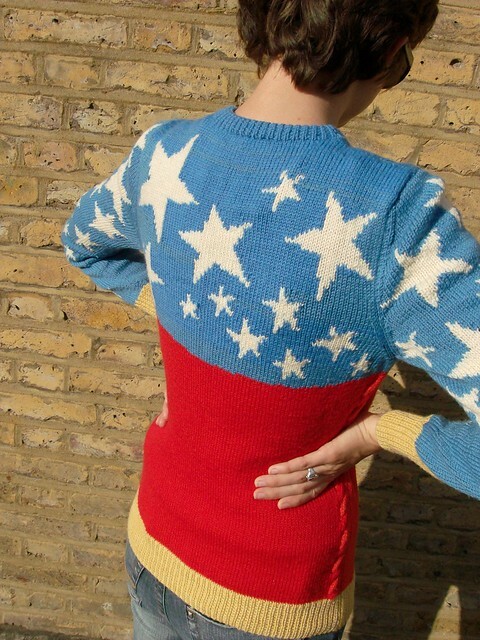 If you like it, there’s still one more left on Fab for £935 (eek!). 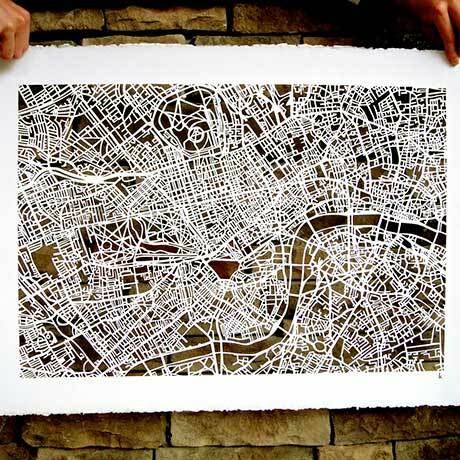 If that’s a bit too pricey, they also have the London map on canvas (£95) or as a small print (£19.50). 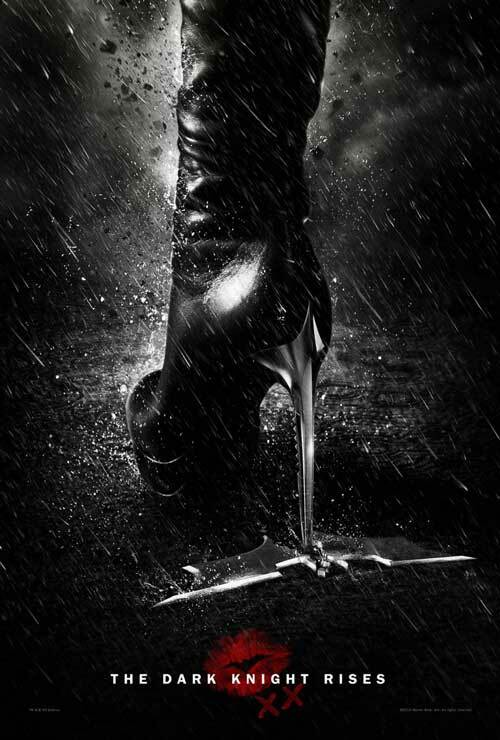 It’s been a couple of days now since I saw The Dark Knight Rises and I have to say I loved it. I’ll try to do a proper review later this week, but overall I really enjoyed it and think it’s a great conclusion to this Batman trilogy. I was most looking forward to see how Anne Hathaway’s Selina Kyle/Catwoman (although no one actually ever calls her Catwoman in the movie) turned out and I wasn’t disappointed. Her Selina is awesome, switching from sweet and vulnerable to sarcastic and devious in an eye blink. I loved almost all of her scenes in The Dark Knight Rises; I’d so like to see a stand-alone Catwoman movie with her, but I don’t think it’s likely we’ll be seeing one. Of course I was also very curious to see her Catwoman outfit. I like that it’s quite grounded in reality; the suit doesn’t look too costumey and something I’d imagine a cat burglar would wear. I also really like how her flipped up goggles become her “ears”. That’s not something that was in the comics (I think) and I’ve seen some more devout fans online not liking the concept at all, but I like the fact that she’s not obviously trying to dress as a cat. Awesome, right? I’d love a pair of boots like those… well, maybe not with the knives as heels, but the rest of the boot looks pretty slick. So I started googling for a pair like those and I discovered that one of the shoemakers that worked on the boots for the movie wrote a blog post about the boots they created. She works for a company called Theatrical Shoemakers (obviously) and they do tons of shoes and boots for movies, including Prometheus, Snow White and the Huntsman and X-Men: First Class. 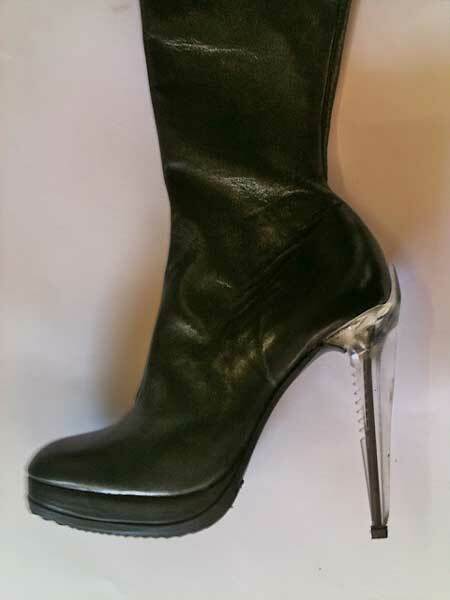 They were made especially for these boots (though not by us), and they resemble knives – they have a sharp edge running along the back of the heel and a serrated section on the inside curve of the heel. These ones were cast in clear plastic (you can see the strengthening metal rod running through it) which made it easier for us to see exactly what we were doing when attaching screws through the insole and into the heels (without poking through the heel). They were later painted silver by the film’s costume department. Next to that one pair with the crazy high heels, they also created a range of other heels in different heights that could be worn during stunts and whenever the shoes weren’t in a camera shot: a low heel, a wedge and mid-height heel which was covered with silver leather. All the boots looks awesome and I so want a pair for myself! I’ve very tempted to email the company and see how much a custom pair would actually cost; I’ve always had problems with finding shoes/boots that fit right (cause my feet are two different sizes), so it might be worth finally getting a custom pair made. Everything just works so well together and the accessories really make it: the hat, the gloves, the bag and the ear rings. I love the cut of the blazer; it has quite sharp lines, but then has that awesome wide round collar. I’ve tried to find out who designed it: was it done by the costume designer or is it from an actual fashion brand? I think it could be Armani, which also makes sense as all of Bruce Wayne’s suits are Armani already, but I haven’t found it among any of their recent collections. Anybody have an idea? So do you agree with me? What did you think of her Catwoman suit? Are you also envious of all her other outfits? Which one was your favourite? I came across these pumps on Pinterest and they’re just so pretty! I love the mixed chains that act as the strap, it almost looks like you’re wearing ankle jewellery. 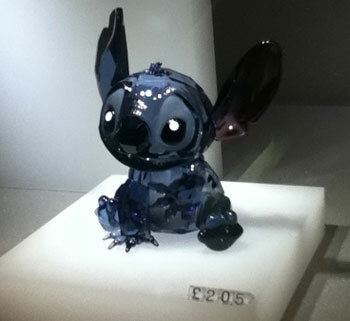 I’ll need to keep an eye out for something similar to these, they’re so adorable! 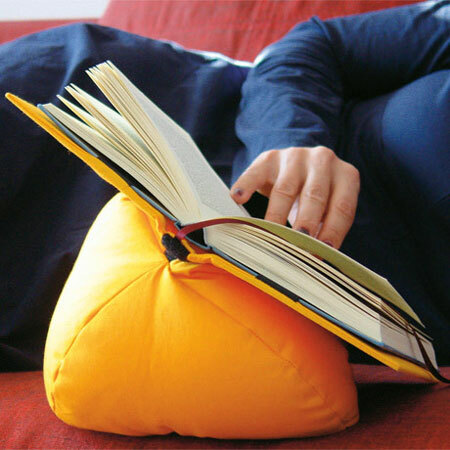 This is a cool idea: a bean bag for your book. I must admit I sometimes have difficulty finding the right position to comfortably read a book, and this seems like an interesting way to solve that. Shakespeare, Hemmingway, Kipling: their words deserve our full attention. The hands-free Book Rest,designed by sisters Angela and Ursula Hartig, lets you park your paperback so that you can concentrate on getting comfy. 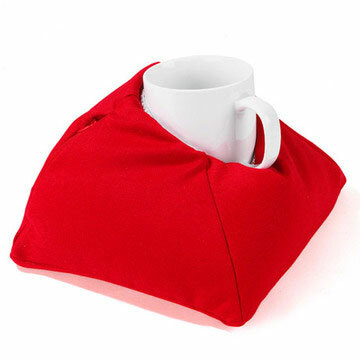 Made up of a book cover and a small bean bag, and held together with Velcro-strips, this helpful design will take unwinding to the next level. I love sushi. It’s not something I’ll make myself though, but if I did, I would so want this bamboo tray! It’s got three depressions into the wood, making perfect spots for your soy sauce, wasabi and ginger. 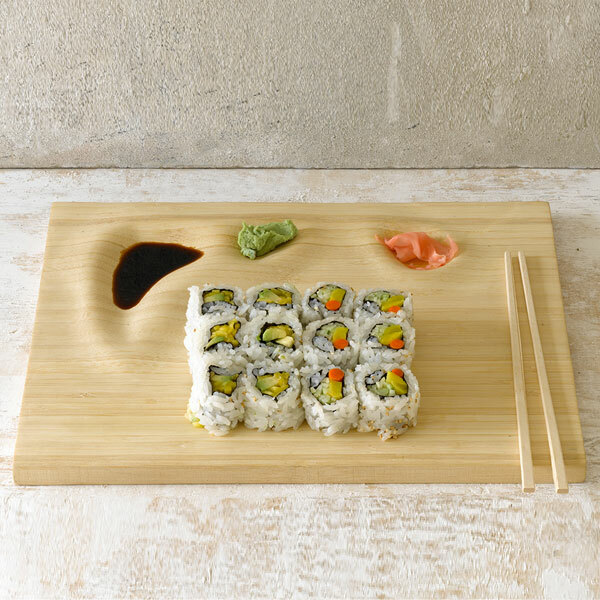 It’s a bit pricey at €47 per board (and if you don’t want to dine alone, you should at least get a second one too), but it’s a gorgeous and unique way of serving sushi. 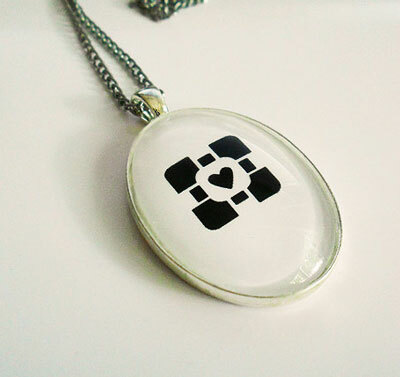 If you want one, head on over to Fab to check it out.